Sterling Silver Shiva Eye Bangle - stunningly elegant! SKU: LBRBT.002. Categories: Bracelets, Shiva Eye. 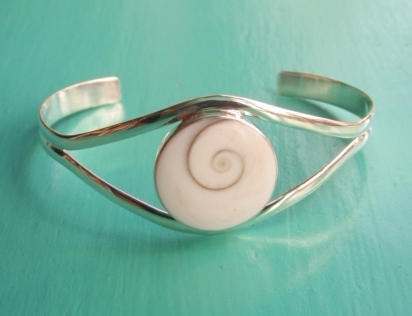 This is a stunning Sterling Silver Shiva Eye Bangle. It is open ended to easily slip on and off your wrist and adjustable to bend to suit your wrist size. 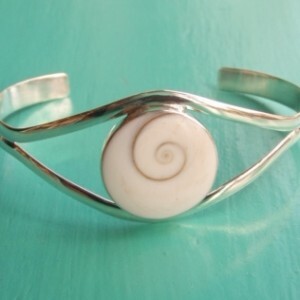 Sitting elegantly in the middle, set in silver, is the naturally elegant spiral that is Shiva Eye. This is the Opercule or the natural protective doorway to a Turban Snail. When it falls off it washes up on the beaches as a seashell. 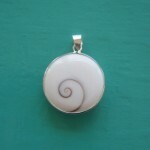 Take a look at the matching pendants which show the two sides to the Shiva Eye – the pearly brown/orange eye and the spiral on a white background. 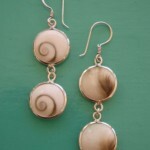 Exquisite, summery, fashionable and very easy to wear. Combine it with one of our Adjustable Shiva Eye Rings or a Pendant and you are sure to stand out from a crowd!